Loving the way she poses for the camera. 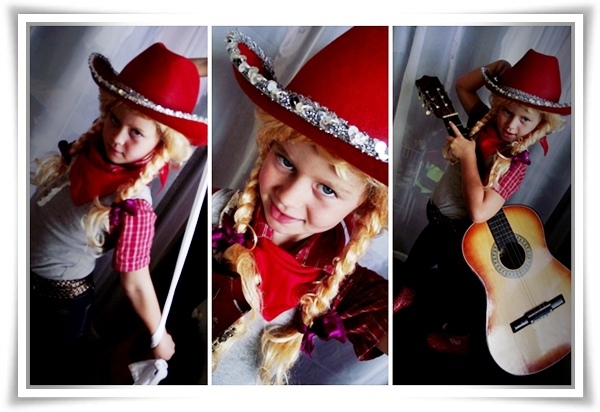 The way she turns things from her wardrobe into a cowgirl outfit. The way she puts all the bits'n'pieces in a bag ready for her little brother's party in three weeks. Love that she plans ahead. A word of warning: before you play this clip, turn your volume down. This guy is LOUD. But very cute. He has Grandma in stitches on the webcam as he stands on the chair and sings at the top of his lungs, "YOU and ME! we can BE action heroes... woah! woah!" Just had to share it with you-all. Cos he makes me smile with his enthusiastic singing, this little super guy. He has blog-posted three times this week! Wahoo, I have a disciple! Love his latest story, about how he loves Captain Underpants books. and that he also has the makings of a true blogger. He clicks "POST" and then races to see if there are any comments. He turns on the computer and clicks to his blog to see if he has any new followers. He's not even a born and bred kiwi ya know. No.8 wire is not in his blood. But he has embraced the Kiwi DIY mentality, strapped on a tool belt and built our kids a phenomenal structure that will not blow down in a storm (or fall down under the weight of young pirates). Love that it's nearly finished. Just a few finishing touches. Already the monkeys among us have found a way to climb up to the top level and play lego. Or launch feijoas at innocent passersby. 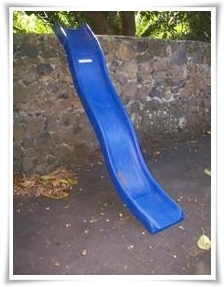 Loving that I just scored a cool-as slide off TradeMe for $120. It's solid-as. One of those heavy-duty moulded plastic ones... that also becomes a waterslide when you clip a hose on. It's a present for Scrag's birthday. I think he'll love it, don't you? And look. 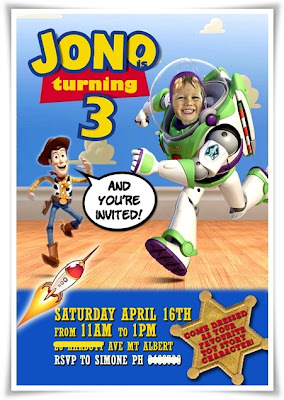 Here's his birthday invitation. I finally finished it yesterday and sent it off to get printed onto magnets. He is absolutely tickled that he is Buzz Lightyear - he's desperate to dress up as Buzz. Lucky I have a cool-as Buzz/Woody reversible costume hidden away for his birthday aye? So there's lots I'm loving. But. I'm not loving that it's 9.30pm as I write this and my eldest two are still awake. Not loving that we're all missing Dave the cat. Not loving that I'm doing the Walk for Christchurch and I have done no prep, I have no shoes and I have no sponsors. I'll sponsor you-but only if you buy some proper shoes!!! I love all of this!!! That picture of "Captain Underpants" just made my day. 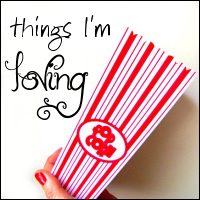 Loving everything - that clip is so cute, the cow girl is so sweet and loving your birthday invite!! That structure hubby is building is amazing! cool as party invite!! You are so clever!!! Ive gone and sponsored you!! its the one that says GO SIMONE GO!!! lol. love miss fab's costume, she has your creative flair!! I only have one sponsor and have only done one walk in the past month... so much for training!! Since writing this I have checked the fundraising page and I DO have two sponsors! (shared with gail - but still my name is AT LEAST there!) Thankyou Leonie and Trees!! And thanks Linda for the offer too! I accept the challenge of finding new shoes and I am heartened by Meg's lack of training - sad as that is. It means I won't be slowing EVERYBODY down but might have a freind or two who won't be too annoyed by my slowness! PS are we getting a route map? I suspect I might be in the trailing bunch and might lose my way...? Love love love the photos of Princess and Dash and absolutely love Scraggs video. You now have 3 sponsors now, put me down for $50. Ps. I posted a comment on Dash's blog, but not Abbey's tell her i did try. What gorgeous kids you have. YOu're doing a great thing regardless of sponsors your solidarity is a gift! Your kids rock. The fact your daughter poses so well and your son wants to put that photo on a blog. AWESOME! !